Five educational planners from Lao PDR have arrived at the International Institute for Education Planning (IIEP-UNESCO) in Paris, France to complete the Advanced Training Programme (ATP), a Master’s level training course in educational planning and management. This new group, as well as a trainee from Mali, joins the other ATP trainees who started at IIEP in January 2018. This final phase of the training follows a two-year long tailored training programme, which specifically responded to the needs of the Laotian education system while remaining equivalent to the Paris-based training. The Laotian participants will complete their training after three months in Paris. IIEP’s ATP programme traditionally consists of two distance education modules plus a six-month residency at IIEP in Paris. The Institute’s increasingly flexible approach to course design and delivery means that professional planners can also pursue a customized approach tailored to national needs. As part of this programme, the trainees began with IIEP delivered courses in Lao PDR. They now join the entire ATP cohort (2017-2018) for the remainder of the programme. In the coming months, they will study three specialized courses in educational planning and management and will complete a project in both Paris and Lao PDR, focusing on a specific national education challenge. Phanthanome Didaravong, a statistical officer in the Department of Planning within the Ministry, said she looked forward to taking the upcoming specialized courses at IIEP, which responds fully to her professional commitments. Prior to arriving in Paris, the trainees completed a short face-to-face Foundation Course from 14-16 March in Vientiane, Lao PDR. This session followed a month-long e-learning phase and focused on integrating the targets of Sustainable Development Goal 4 (SDG4) into the country’s Education and Sports Sector Development Plan (2016-2020). 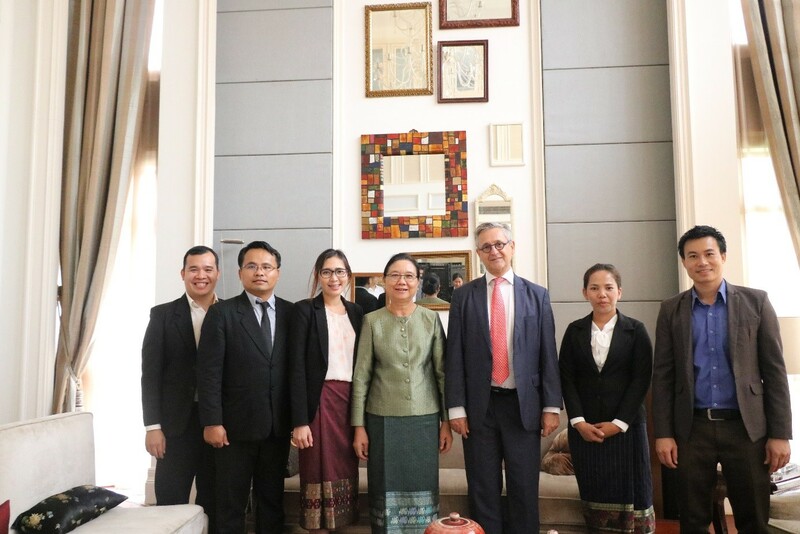 The trainees during a luncheon hosted by the EU Ambassador to the Lao PDR, Mr. Leo Faber (3rd from the right) with the honourable Minister of Education and Sports, Madam Sengdeuane Lachanthaboun (4th from the right). Part of the objective, Didaravong said, is also to share the new skills and practices acquired through IIEP training with colleagues across the districts and provinces in Lao. IIEP appreciates the financial support provided by the European Union, which is allowing Didaravong and her colleagues Vanthala Souvanxay, Chaleunsouk Sisouvong, Bouavanh Chanthanongdeth, Vannasouk Bouasangthong to train at IIEP and develop their planning skills.